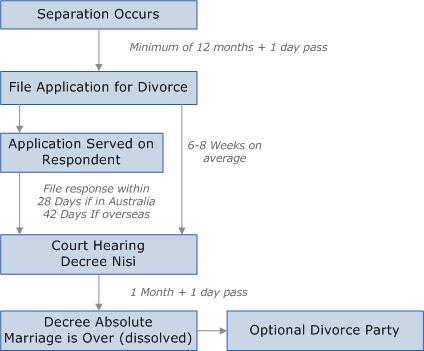 This diagram above shows the basic process that needs to be followed when applying for a divorce. After separation, the primary requirement for a divorce is that you have been legally separated for a period of at least 12 months. To file for divorce in Australia, you will also need to be an Australian citizen or have lived in Australia for at least 12 months. If you weren’t born in Australia, you may need to prove your citizenship. An Australian court can dissolve marriages that occurred outside of Australia, but if the Marriage Certificate is in a language other than English you will need to provide an official translation with your application. To file your divorce application, you need to first decide if you are going to file a joint application with your ex-partner or a separate application. A joint application makes everything a bit easier as you won’t need to attend court. The other option is to make a sole application, all the documentation is the same – you just file everything by yourself. This option can be used when the other person refuses to sign documents or you don’t know their whereabouts. 1. Complete an Application for Divorce, have a lawyer complete one for you. 2. Have the application affirmed and signed before a lawyer, or a Justice of the Peace. 3. Photocopy the application and any supporting documents twice. 4. File the original application, the 2 copies and a copy of the marriage certificate at a family law registry. At this point, a fee of $550 must also be paid. When you file your application, you will be given a file number and a hearing date and time. If you make a joint application, the court will keep the original and give your ex-partner a sealed (stamped) copy of the application. If you apply on your own, you will be given both sealed (stamped) copies, one of which you will need to serve on your ex-partner. If you applied on your own, you will need to serve a sealed copy of the application and an information brochure (which the court will give you) on your spouse. You will need to do this at least 28 days before the hearing if your ex lives in Australia or 42 days if they live overseas. If you think your ex-partner will sign and return the Acknowledgment of Service form, you can mail everything to them. If you need to serve the documents by hand, you cannot do this yourself – it must be done by a third party – which can be a friend or relative. When serving the documents, your spouse needs to sign an Acknowledgment of Service form. If your ex refuses to sign the form, you will need to use a process server to serve the documents on your ex-partner. Even if your partner refuses to sign, the process server can sign an affidavit stating that the documents have been served on your ex. If you cannot find your spouse, you can apply for a substituted service (serving the documents on someone else who can then give them to your ex-spouse) or a dispensation of service (you do not need to serve the documents). You can apply for these through another form and an affidavit filed with the court. Your application for dispensation or substituted service will be heard at the same time as your divorce hearing. If you apply for dispensation, you will need to attend court as you will need to prove to the court that you have exhausted every option available to you to find your ex-partner. The court may adjourn your case and direct you to take extra steps – for example sending a letter to friends or relatives, searching the electoral role or advertising in a local paper. If you made a joint application, you do not need to attend the hearing. If you made a sole application and have no children under 18, you do not need to attend the hearing. If you made a sole application and have children under 18, you will need to attend the hearing because the court will need to make sure that steps have been taken to ensure the continuing care of the children. If you have made an application for dispensation or substituted service, you will need to attend the hearing. The court may adjourn your case if it feels that some of the information supplied wasn’t sufficient – for example if you haven’t provided enough proof that you have been separated for a minimum of 12 months. There are only two ways to stop the application for divorce if your ex wishes to do so. The first is to argue that both of you haven’t been legally separated for at least 12 months and the second is to argue that the magistrates court doesn’t have any jurisdiction over the divorce. Assuming your divorce application is successful; the court will grant a divorce order which will then become permanent one month and one day after the court hearing. You will then be sent a certificate of divorce and will be free and clear to throw the divorce party you have always wanted!